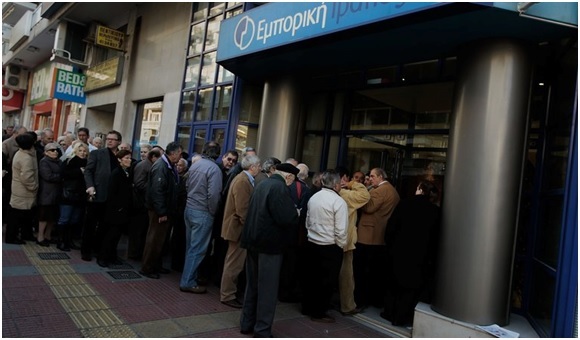 Greek depositors—overwhelmed by the fright of a Greek default or an exit from the Euro zone (which would mean a return to the drachma)—have been pulling millions of Euros out of the nation’s banks over the last few days. Nearly 900 million Euros flowed out of Greek banks on Tuesday alone. Germany’s Wolfgang Schaeuble and Greece’s Yanis Varoufakis met IMF managing director Christine Lagarde and Jeroen Dijsselbloem, the Dutch finance minister who heads the Eurogroup. It looks like a temporary agreement has been reached but disagreement can enter at the last moment and talks could collapse. Talks continue through the weekend. Germany does not want Greece to leave the Eurozone, but neither will Chancellor Merkel cave to Greek whining. If Greece leaves the Eurozone Germany stands to lose over 80 Billion Euros, not a pleasant thought, but not hopeless. But the odds are that Greece will yield to the ECB [European Central Bank] rules to restructure Greek debt…after all, a Greek exit would threaten the newly elected Greek Syriza government, given that most Greeks say they want to keep the euro. 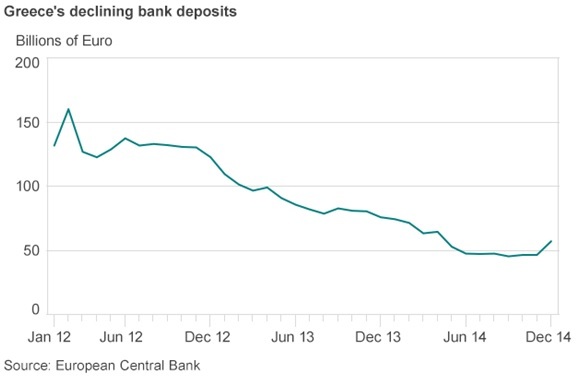 If Greece were to leave the short-term impact on Greece would be financial chaos–Already Greeks are withdrawing huge sums of their money from Greek banks. There is endless debate as to what would happen to the European Union if Greece leaves the Eurozone. Some say if Greece leaves then it is just a matter of time before Spain and possibly Italy would leave, wreaking havoc in the world financial markets. Others say, let Greece leave, a Grexit will only strengthen the remaining members of the Eurozone, and finally the European Union will be rid of one of its most difficult members. I simply do not know what will happen should Greece leave—so we wait and watch. What is especially interesting is the leadership role we are witnessing out of Germany. Angela Merkel’s ascendency to become the most powerful leader in Europe is linked closely to the euro crisis. It was European leaders who had to make money available for the bailout of Greece. Given that Germany had the most money to offer, Germany’s Angela Merkel quickly became the most important leader in Europe. All eyes are on the German Chancellor. Many Greeks consider Merkel to be an economic Nazi, and they hate her. But Greece takes little responsibility for its wild spending, so Greece should not complain—let’s remember the truth of scripture: “The rich rule over the poor, and the borrower is servant to the lender”—Proverbs 22:7. Germany is very rich and Greece is very poor—whose fault is that!